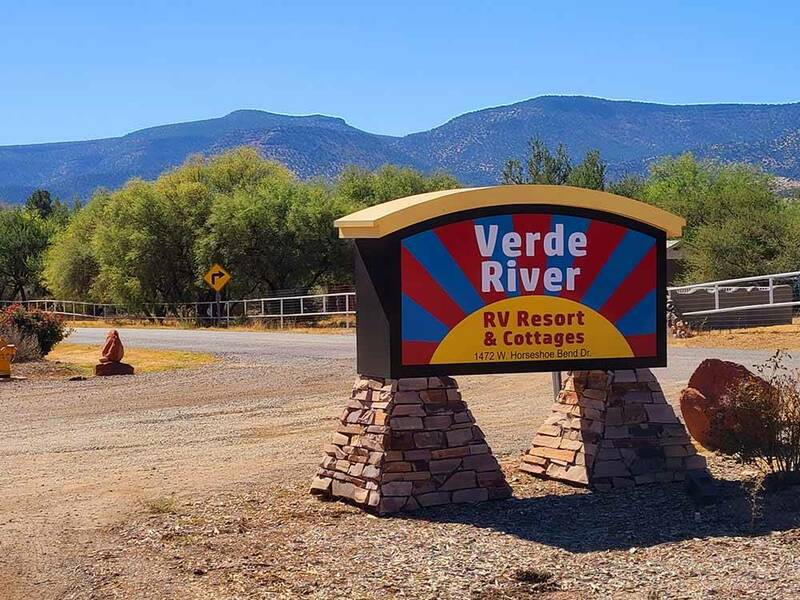 Easy I-17 access, exit #287, 100 HUGE, level RV sites, 50+ cottages, 1400 ft Verde River front, pool, spa, fitness center, new private bath suites, free LD phone, WiFi and Cable TV. 3000 ft elev for year-round family fun. 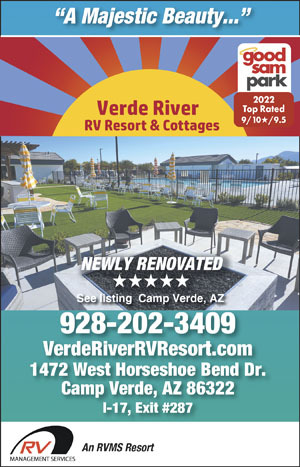 Simply the best RV Resort I’ve stayed at and will definitely stay here anytime I’m in the area. Nothing negative,all positive. Friendly and Helpful staff. This is a RESORT not an RV park. This is truly a hidden gem you must visit!!!! This campground will eventually be a very nice campground. The pictures are deceiving however. The space we were in will be great when it is finished. We had plenty of room to play ball with our dog, which is great because when I called for reservations, I was told there was a dog park, which there isn't at this time but they will eventually have one. They are trying to get grass to grow which will be wonderful but right now it's weeds. I think the biggest disappointment was the price that we paid. Maybe they should lower the prices until they have the park completed or at least the spaces in great condition. We don't use the amenities very often and love to relax under our awning, Unfortunately, this isn't a relaxing place. HOWEVER, I think it will be as they are working hard to make it a nice campground. We were excited to stay at this park. Good Sam recommended. From the description, it sounded amazing. Luxurious even. Not so. They advertised cable, wifi, and so many other amenities. Wifi was non-existent. We were told we could get a signal if we went to the clubhouse. What?!? No cable. No cable hookup. So...we didn't have access to our entertainment system for four long days and three nights. We were placed in section A...between two RVs...very tight...didn't know if we could even put our slides out all the way. So many open spots...we needed 50 amp service for our new trailer...maybe it was the only 50 amp site? Very disappointed. More and better description required for this park. This was not what I expected from a Good Sam recommended facility. It was not taken care of and the pictures are a fraud. There are no real amenities. I feel that Good Sam should take a look at the horrible conditions. The people that ran the park were really nice. I felt sorry for them having to charge for such an awful park. I wouldn't have stayed there if the park had been honest. We made or reservations before we read the earlier review but decided to keep our four night stay in place. The park is in the back of an older neighborhood but is very convenient to I-17, Cottonwood, Sedona and other area attractions. First impressions are it's an old KOA (the office roofline gives that away). Many "full-timers" in older but clean rigs spread through the park. All looked clean and I like the idea of folks that are always around to keep an eye on things. The reservation web site is crude in that you must pay attention to what you ask for. They have 30&50 amp, with and without sewer. We requested a pull through site with 50 amp and full hookups. When we pulled up to our site it was as reserved. The electrical box was old but operational. Water and sewer connections were fine. Two huge trees on either side of our rig kept the sun off and it was level. Many of the sites were like the one we got with lots of mature trees. Very quiet and relaxing place to stay. Upgrades to the park by the new owner are going to start soon but they haven't started yet. We didn't go see the pool or other advertised park amenities so I can't comment on those. The river isn't visible from the upper bank, we didn't climb down to get a better look. Worth the price especially with the Good Sam discount. We will be back to see the progress. The only amenities at this park are unkempt minature golf, weed infested horseshoe pits and a tennis court. The delapitated cottages were removed. The pool is covered and out of service as is the hot tub. You can't get to the river because the path is steep and over grown. No fishing is possible. The Laundry facilities are old and wook poorly. They don't sell ice either. The club house is torn down to the studs. Sign in front of park list the park will be remodeled by spring, but they haven't started anything yet. The grounds are covered with weeds and goat heads so you can't ride a bike in the park. Don't come if you have children because no fence around pool and they took down the fence between park and irrigation ditch. They don't know when they will start the remodel trouble getting permits. I would recommend waiting until the park is renovated before you visit. Thought we'd arrived at the movie set of "Deliverance". Right as you enter the park (after you have driven through a trailer trash neighborhood and come in through an open area of dusty gravel) you see obvious long term "guests" in old, trashy rv's. Farther back in the park they do have some newer rv's that are much nicer. This park needs to make sure the long term people in their trashy rv's go to the back of the park and put the nicer rv's up front so it doesn't look so scarey. They advertise: Water / Sewer/ 50 amp elec/ Wifi / Cable / Pool / Spa / Mini-Golf / Rec Room. What they had: NO Sewer hookup; NO cable; Pool fenced off and covered (it was hot outside); NO spa; Wifi - couldn't get it - I complained and they admitted it's very low; Rec Room NO, but maybe it was under renovation??? - Putt putt golf - yes, but not taken care of. The picture they show on their website must be old because it doesn't look like that at all. NO; "Lawn" - all we saw were clumps of dead grass and weeds. Oh yes, and the Verde - "green" river is a nasty pea soup green and looks like a drainage ditch. This "park" looks like a rundown, trashy, old KOA. They do have a sign as you enter that says, "open during renovation". They should NOT advertise all the amenities until they are actually there. On the "plus" side: it was only $37 a night (and rightly so); they did have 50 amp; and there are lots of sites under the shade of Cottonwood trees. It WAS very quiet and nothing of ours was disturbed but the way it looked I was afraid of leaving anything outside and locked everything up when we went to tour Sedona. We had made reservations by phone and by the time we arrived it was too late for a refund. So now you know. Your choice if you want to stay there. From Jct Hwy 260 & Horseshoe Bend Dr: Go 1 1/2 mi N on Horseshoe Bend Dr (R).